Thanks for having me, Melissa! I’ll take a tall mocha with double whip and a kitty. Speaking of double, my crime caper DOUBLE WHAMMY’s birthday is just four days away, so I’ll take a party hat with my mocha. And one for the kitty, please. In a nutshell, or in a pitching elevator, as it were, Davis Way thinks she’s hit the jackpot when she lands a job at the fabulous Bellissimo Resort and Casino in Biloxi, Mississippi, where she runs straight into her ex-ex husband, a rigged casino game, her evil twin, and a trail of dead bodies. Davis learns the truth and it does not set her free—in fact, it lands her in the pokey. Buried under mountains of mistaken identity, unable to seek help from her family, her luck seems to have run out when her landlord Bradley Cole steps in. Make that her landlord, lawyer, and love interest. Together they find the answers. That year, U.S. consumers spent 10.2 billion at the movies and 35.65 billion in casinos. It’s crazy fun entertainment. Forty eight states have some form of legalized gambling, every mainland American is within a three-hour drive of a casino, and it’s a big, big deal. I say some casino gambling fiction is in order. So, Janet Evanovich, you ask? Yes, and what a blurb. I’m humbled and grateful. Yes, I know her. Many years ago, the year Janet did her SEVEN UP tour, a very good friend of mine and I, huge fans, decided we wanted to go to a book signing. Let’s meet this woman who keeps us in stitches. None of the tour stops were even close to our homes in Tennessee, so we chose one in a state neither of us had set foot in—Vermont. It was at a lovely indie bookstore, a stone bridge and a state line away from the Dartmouth campus, for a small, reservations-only gathering of the first thirty or forty registrants. We made the list. Janet was curious as to how boring our lives were that we would travel that far to meet her, so after the signing we joined her for a lovely dinner at an equally lovely bed and breakfast adjacent to the bookstore. I’ll skip the next fifteen years and just say we’ve stayed in touch. And one more thing—she’s a rock star. Some scoop about me? (Big yawn.) I’ll share a few potpourri things I love to know about other writers. I began writing at a crossroad in my life; my youngest started Kindergarten the same week my oldest left for college. I have a tattoo. I collect first-editions, among them, a signed, first John Steinbeck. I adore Carl Hiaasen’s and Richard Castle’s work. To offset all the time at my desk, I work out six days a week. I’ve had two agents. The first after (not kidding) 200 queries, and she represented my first four manuscripts, all narrative fiction. Tomes. Forever on my hard drive. After throwing in that towel, I took a year off to hang out in bookstores, casinos, and on the sofa with a good mystery. I read 183 cozies-whodunits-thrillers that year. I sat back down at the computer, wrote Double Whammy in four months, and signed with the magnificent Stephany Evans of FinePrint Literary Management a few days after sending out my fifth query. Sometimes it just clicks. The next Davis Way crime caper, DOUBLE DIP, will be out this November, 2013, Henery Press. (Smooches to the Hens!) This kitty has destroyed his party hat. Thanks for having me, Melissa. Happy reading and writing! Thank you so much, Melissa. Love your site! Love the kitties! 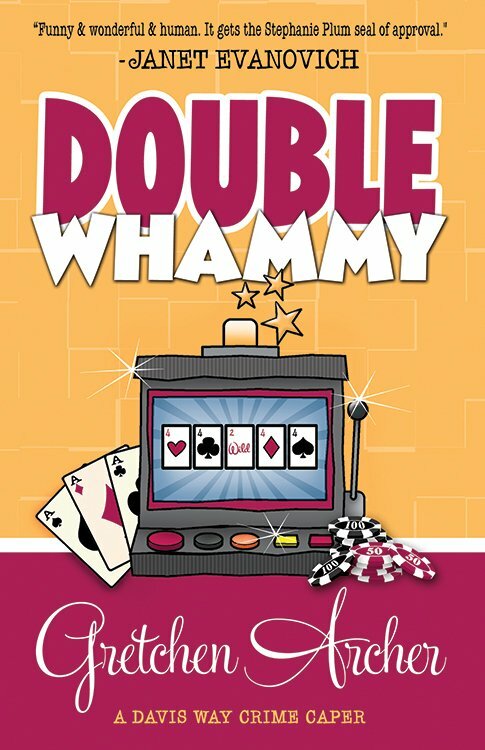 Leave a comment with your email address for a chance to win a signed copy of Double Whammy with swag!!! Thank you, Anna! It's all very exciting, and I've had three mochas. Kinda bouncing off the walls, here. Melissa is a wonderful hostess! Jealous of your first editions...(I'd like pictures). What a great interview!! Your journey is impressive and I'm so glad you ended up at Henery Press. :) DOUBLE WHAMMY is so unique and entertaining I've been telling everybody to pick it up when it comes out! Happy upcoming release day!! Thanks, Alicia! Davis Way is a study in nice accessories, huh? And I couldn't love the Hen House more than I do. Thanks, Toni, although I put in my time before getting signed so quickly. Query Schmery. You want a mocha? They're good! 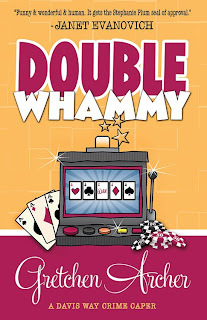 I was one of the lucky few who got to read DOUBLE WHAMMY before it released. You should all be so, so jealous. This book is incredible. I literally ignored my family on vacation so I could finish it. It was that good. Unfortunately, now I'll have to charge Gretchen Archer for the therapy bills for "mother abandonment on vacation" accusations. I digress, if you love Carl Hiassan and Janet Evanovich, you will love, love, love Gretchen Archer's Davis Way. You will feel like you have crawled inside her head and are living out her adventures. Which is sometimes uncomfortable. But in a good way, like an "oh my gosh, get us out of this mess" way. And in a very good way when Bradley Cole is hanging around, whom I'm constantly calling Bradley Cooper for some reason. You will love this book. I guarantee it! Wonderful interview. I also received a cope of Duble Whammy before it was released and agree whole heartedly with Larissa. This is a wonderful bookand I loved it. I have read it twice already and plan on reading it again. Get this book you will love it too!!! Thank you, Susan M. Boyer, who's busy polishing her AGATHA for Best First Mystery! Our little Hen House is bursting with pride. BOARD STIFF is tearing up the charts, Susan's fantastic award, Double Whammy's release, then STILL LIFE IN BRUNSWICK STEW releases on 5.21-- we have all sorts of Hen Stuff on the horizon. We're busy, busy Hens. I'm impressed you got the cat to keep the party hat on that long! This cat is a sweetheart, Libby. I've named him Skittles. I clicked on Max's picture. He is quite handsome. My Yorkie, Bently, says hi. You can find his picture on my webiste www.gretchenarcher.com Thanks for stopping by Melissa's! She's a great hostess! Thanks Gretchen! Isn't Max the cutest??? Thrilled to have you here cutie! What fun! I'll definitely have to check out this series! I am also a bit in awe of your signed first edition Steinbeck! I have a LOT of books, including all my original Nancy Drews! Third time lucky? I've been trying to comment for ages now but WP keeps telling me I don't own my identity. I feel like Davis! Going to try my Gurgle account instead. Pass me a cat. I can't wait til DOUBLE DIP. Could it be that you live, uhmm, in a foreign country? Wow! I had no idea we spend more money at casinos instead of movies but that totally makes sense. Gretchen recently did an interview with us over at More Than A Review--I grilled her and got some really interesting answers! Check it out here!